The huge collection of coloring pages is classified by gender, levels of difficulty and is updated fairly often. Color & Draw App coloring tool is the perfect way for your child to express his painting art by using either a stylus or just his fingers. Several tools are available as marker, brush, pencil and the can of paint that helps young children to color without going outside the lines. Let your child's imagination run wild! 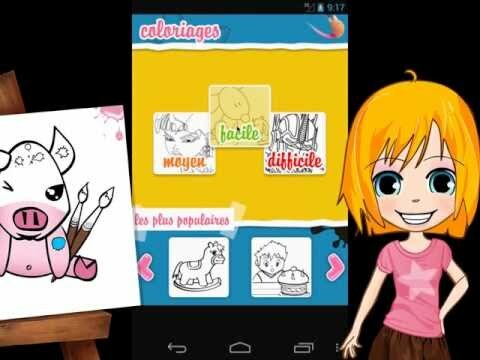 Color & Draw App drawing tool allows him to achieve masterpieces either starting from scratch or by following pre-designed templates (animals, characters, letters of the alphabet, numbers, etc...). Once each drawing is achieved, your child will have the option to either save or share (by sms, e-mail, social networks, etc...) his masterwork. Hellokids is one of the most followed websites for children worldwide with over 6 million visitors per month. We are pleased to share our experience and expertise in drawing and coloring activities with your children in a playful, simple and intuitive way! Enjoy!